AT long last, the die has been cast for the 14th general election (GE14), with Prime Minister Datuk Seri Najib Razakâs announcement last Friday of Parliamentâs dissolution on April 7. By all accounts, this will be the toughest battle to date for Najib and the Barisan Nasional (BN) government â" the âmother of all electionsââ" as Najib, who is the Umno president, warned party members last November. What makes it so significant is that Najib will be up against the extremely forceful former prime minister Tun Dr Mahathir Mohamad (and Najibâs former deputy Tan Sri Muhyiddin Yassin), in a case of the sifu turning against his protÃ©gÃ© . For the Malay population, who make up over 67% of voters together with other bumiputera groups, this reflects a breaking of ranks within the countryâs leadership that changes the whole tone of the countryâs race-based politics. Not just that, Dr Mahathir has teamed up with his former nemesis, Datuk Seri Anwar Ibrahim, the consensual leader of the opposition, to challenge the BNâs unbroken rule spanning six decades. Now that Najib has thrown his hat in the ring, political observers expect events to move quite quickly. The dissolution of Parliament is announced through a notice from the Dewan Rakyat Speaker to the Election Commission (EC). Similar notices are issued by the Speakers of the State Legislative Assemblies, except for Sarawak, which held its state election in 2016. Within 10 days after receiving these notices, the EC must hold a meeting to decide on key dates for the general election. The next step is for the EC to issue a writ to returnin g officers throughout the country authorising them to conduct elections in their respective constituencies. This can happen as early as Monday, since one working dayâs notice is required under the election regulations for the writ to be issued. Next, a notice of election is posted for public viewing, which will state the dates for nominations, early voting and regular voting. The earliest that nomination day can be set is four days after the election notice, which means it may fall on April 14 or later. By this account, polling could be as soon as April 26, providing for the minimum campaign period of 11 days, political analyst Wong Chin Huat said in a WhatsApp message. âBut this is possible only if all state governments (except Sarawak) get their assemblies dissolved before Monday,â he said. Senior Penang exco member Chow Kon Yeow is reported to have said that the state assembly would probably be dissolved a few days after Parliament. âWe donât have to do it on the same day, it can be tomorrow or a day or two after,â he told the media. Najib has taken his time to call for this general election, just as he did for the previous one in 2013, when he waited till almost the end of the full five years of his governmentâs term. In this, he is unlike his predecessors, who had called for elections during the fourth year of their terms. This election will be the first in which the opposition parties will be fielding their candidates under a common logo â" that of the PKR. It is a move that Dr Mahathir has pushed for and is supported by the DAP, Amanah and PPBM, which has been slapped with a provisional ban by the Registrar of Societies. The effect sought for, clearly, is to generate confidence in votersâ min ds of a unity of purpose among the parties. Among the issues that are seen as detrimental to the oppositionâs chances of winning is the redelineation of constituencies that was passed by Parliament last week and became law almost immediately. 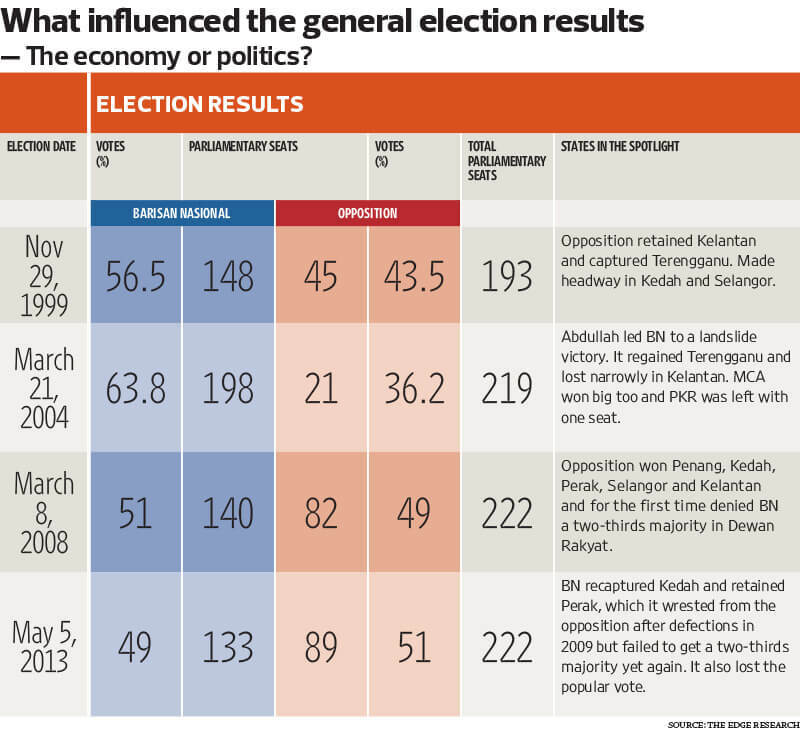 The redrawing of election boundaries is said to favour BN, but the government has denied this. Another controversial development is the passing of the law against âfakeâ news in the last days of Parliament, which has been decried as a serious threat to freedom of speech. However, Minister in the Prime Ministerâs Department Datuk Seri Azalina Othman Said argued in Parliament for the opposite view, that it was in fact aimed at protecting the public from fake news and to ensure freedom of speech as provided for under the Federal Constitution. Her cabinet colleague Communications and Multimedia Minister Datuk Seri Salleh Syed Keruak has dismissed claims that the bill was aimed at curbing discussion of the trouble s at the 1Malaysia Development Bhd (1MDB) state investment company. While overseas media reports suggest that the 1MDB scandal would affect votersâ sentiment, local surveys indicate that matters of governance and corruption were more important to the urban, middle-class electorate than the general population. Economic concerns, including the rising cost of living, stagnant incomes and depressed commodity prices, resonate more deeply with rural voters, the young as well as the urban poor. Highly conscious of these issues and their likely impact on the votersâ mood, the government has announced a steady stream of benefits that serve to lighten the burden of the people in the run-up to the dissolution of Parliament. Najib took the opportunity during his announcement last Friday to trace these benefits, ranging from cash handouts to jobs created to skills training and public amenities delivered by his administration. Besides these, there are big-ti cket projects, including the MRT network, rural roads and the transformative Pan Borneo Highway project. With the financial resources of the federal government at hand, Najib and BN have a clear advantage in this area over the opposition, which must bank on the administration of its two showcase states â" Selangor and Penang â" besides the promises to abolish burdensome taxes if they are voted into power.